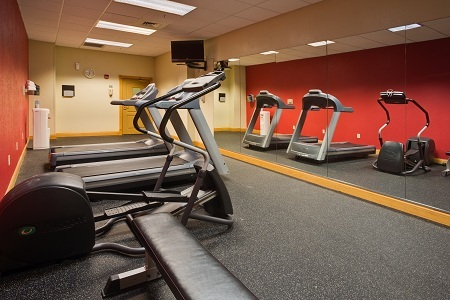 Please be advised that the fitness center is currently undergoing repairs and is unavailable for use at this time. We apologize for any inconvenience caused. Welcome to the Sunshine State! Once you’ve touched down at Orlando International Airport (MCO), take the hotel’s free airport shuttle directly to your comfortable room or suite at the Country Inn & Suites® by Radisson, Orlando Airport, FL. Our hotel lies within 24 minutes of Walt Disney World, Universal Orlando Resort and SeaWorld, so you can bounce around Orlando’s most beloved theme parks with ease. Tuckered out from a day of adrenaline-pumping thrills? Enjoy a relaxing day at Cocoa Beach, or treat yourself to some retail therapy at nearby shopping venues like The Florida Mall or Bass Pro Shops. 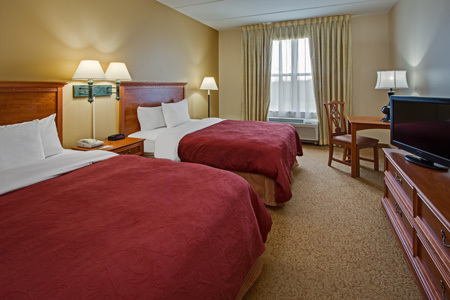 If you need additional space for your family, reserve a One-bedroom Suite which features a private bedroom with a king bed and a separate living room with a sleeper sofa. 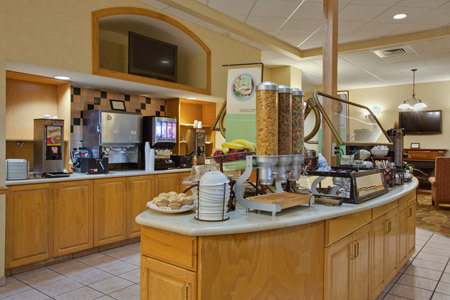 Fuel your day of theme park visits or Orlando exploration with our hotel’s free, hot breakfast. Sample Belgian waffles, fresh fruit and a daily selection of hot items, all served in our cheerful dining room on classic diningware. You can choose from a variety of excellent nearby restaurants for lunch and dinner. Dive into fresh, farm-to-table fare at Cork & Fork American Grill, which serves tasty entrees like drunken scallops, blackened haddock and eggplant Parmesan. SeaWorld – Spend the day with penguins, sharks and sea lions at this popular amusement park just 20 minutes from our hotel. Ride a thrilling roller coaster like the Mako, Kraken or Manta, or catch a live dolphin show. Walt Disney World – Travel about 17 miles to visit the four theme parks and two water parks that make up Walt Disney World. Race down Splash Mountain at Magic Kingdom, or stop by Hollywood Studios to meet your favorite Star Wars characters. Universal Orlando Resort – Climb onboard the Hogwarts Express to experience the magic of the Wizarding World of Harry Potter. Universal Studios and Universal’s Islands of Adventure both lie less than 20 minutes from the hotel. 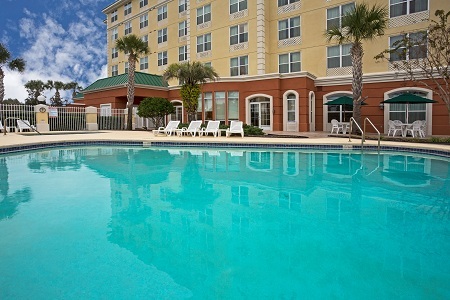 Hosting a social gathering or business conference in Orlando? Our hotel’s flexible meeting facilities near the Orlando airport can accommodate 14 guests in the boardroom and up to 50 in the larger meeting room. Keep attendees refreshed with complimentary coffee and water service, and play slideshows or videos with free Wi-Fi.